On August 13th, 2018 a headline in the International Business Times read, “Turkey facing currency meltdown and credit crunch fears”. The “meltdown” the article was referencing was a three day, 30% decline in the value of Turkey’s currency, the Lira. Normally, headlines like this are rare, especially for a country that is home to nearly 80 million people and has been considered for inclusion in the European Union. Yet in 2018, headlines like this have felt all too common. 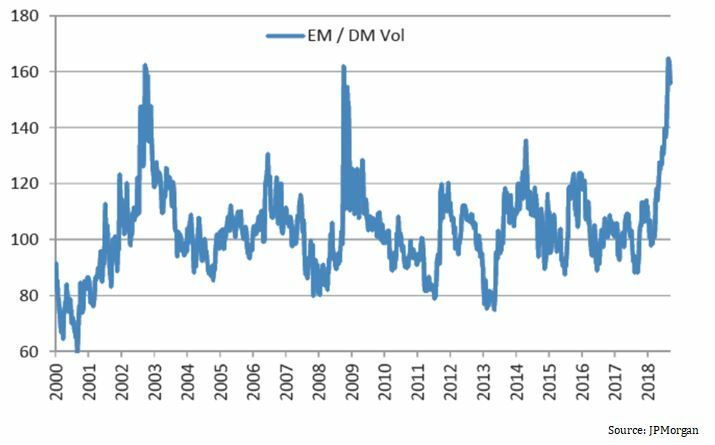 In fact, 2018 has been the most volatile year for emerging market currencies since 2008 when the U.S. was going through the worst recession since the Great Depression and economies across the globe were sputtering. But it is not just emerging market currencies that have had a turbulent year. Nearly every major currency across the globe, including the Euro, the Pound and the Yen has lost value versus the U.S. Dollar this year. In this article we will take a look at what has been causing this volatility, the impact it has on client portfolios, and what is likely to happen next. The fireworks that we have seen in global currency markets this year have been driven by several main factors. First, interest rates in the U.S. have marched higher as the Federal Reserve continues to distance itself from other major global central banks, most of whom are still holding interest rates near 0% (or below). Higher interest rates tend to increase demand for currencies which has provided support for the dollar and been a drag on others. Second, protectionist trade policies in the U.S. have weakened the currencies with which the U.S. has had trade disputes. Specifically, we saw the Mexican Peso, the Canadian Dollar and the Euro weaken while the U.S. attempted to re-write long standing trade agreements. China, with whom the U.S. is still in a fierce trade standoff, has seen its currency fall by roughly 5% so far, year to date. Another factor that has contributed to the hysteria this year is a handful of isolated events in countries like Turkey and Argentina. As previously mentioned, the value of Turkey’s currency has been ravaged this year, down over 35% from the start of the year. Turkey’s volatile political environment, outsized government debt and runaway inflation all contributed to the sharp deterioration in the local currency. Argentina, a country with a long history of financial problems, has seen an even steeper decline in its currency with the Peso down nearly 50% year to date versus the U.S. Dollar. Like Turkey, Argentina’s bloated government debt and rampant inflation are primary drivers of the Argentine Peso’s collapse. 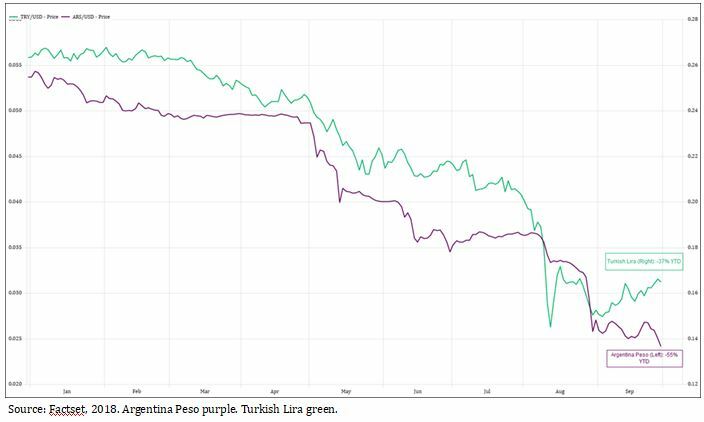 The issues that are plaguing Turkey and Argentina have been mostly confined to those two countries but we have seen some spillover effect into other emerging markets that are perceived to be more vulnerable by financial markets. Now that we have explored a few reasons why we have seen strength in the U.S. Dollar this year, the next logical question is – what impact does this have on my portfolio? As a general rule, any time you see outsized strength in the U.S. Dollar, the area most likely to be negatively impacted is foreign equities (natural resources too but we’ll save that for another article). Because foreign equities are denominated in their respective local currencies, the return that U.S. investors receive is a function of: the stock’s total return in local currency + any fluctuation in the local currency. As an example, the main foreign equity benchmark, the MSCI All Country World Ex-US Index was up 0.7% year to date through September when measured in local currencies. But when you factor in the currency movements we saw in the first nine months of the year the index was down 2.7%. A more glaring example is in Brazil where local equity markets were up 5.9% through the first three quarters of the year but due to declines in the Brazilian Real were down 12.1% in U.S. Dollar terms. For most investors, a country’s currency often is an after-thought, but if you are investing in a region that is susceptible to significant volatility it is important to be cognizant of this added element of risk not present when investing in U.S. equities. While currency swings can be aggravating for investors, it is worthwhile to keep a couple things in mind during periods of heightened volatility. First, at OPCM, we have taken a proactive stance to mitigate the impact of foreign currency volatility by holding a long position in the U.S. Dollar. In effect, any negative impact that the dollar’s appreciation could have in client portfolios is partially mitigated by the return via our U.S. Dollar hedge. Second, we have seen this year that currency movements can have substantial impacts on performance, but underlying company fundamentals are a more important variable, and over time will be a more significant determinant of future performance. At the moment, fundamentals in markets outside the U.S. and, in particular, the regions where OPCM has a larger tactical exposure (India, Brazil, Germany, etc. ), continue to be attractive and could lead to continued gains over time. Lastly, currency fluctuations have tended to be a smaller variable in performance over longer time frames as the movements usually act to offset each other. As an example, in 2017, foreign currency added 9% to the return of the MSCI All Country World Index Ex-US as most international currencies gained ground against the dollar. Our team currently believes that the rally in the U.S. Dollar is somewhat long in the tooth and, as such, our expectation is that currency will likely shift from a headwind to a potential tailwind as we exit 2018 and head into the New Year. Going forward, the team at OPCM will continue to be proactive in looking for additional ways to protect client portfolios from currency volatility, while simultaneously positioning your portfolio to take advantage of the rapidly changing global economic landscape. Jay is an Investment Analyst with over 8 years of experience and is in his 4th year at OPCM. Jay is a member of the OPCM Investment Management Team, and is responsible for research coverage in all asset classes. Jay is a member of CFA Society San Francisco and CFA Institute. Jay received a Bachelor of Science degree in Finance and Accounting from California Polytechnic State University at San Luis Obispo and is a CFA Charterholder.